Home » places » San Jose Park and Zoo of the Year! We are regulars at the Happy Hollow Park and Zoo since it's renovations last year. In fact, we bought the annual tickets and annual parking permit for the whole family. It is the way to go, a couple of trips to the Park and Zoo and it would have paid for itself. There are other types of membership packages you can purchase, for example, with a higher level you would get so many additional guest passes. The guest passes are good for when you want to invite a friend's family. Since we have grandma we purchased the "kid keeper" pass, it allows her to come with us anytime we go. Purchasing the annual tickets was the wisest thing we did this summer and all around good causes. In one way, we are supporting the City of San Jose and it's facility, and in another, we have a place to take Miss T and don't feel like we're spending a ton of money each time. Happy Hollow Park and Zoo have turned into much more than we ever hoped for. This is a beautiful and well layout park with everything in one place, petting zoo, a zoo, parks, rides, show, classes, picnic areas, and even play structures. They also have amazing party areas and hosted party packages. It is one of the best places to take children under 12. 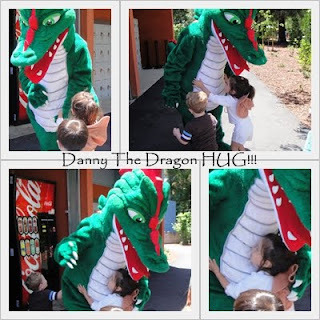 The above image is along the Danny The Dragon ride, which Miss Trinity just loves. For some reason they have a witch stuck under the house. Do you see the red slippers, it made me think of Ruby Tuesday because it looked like the same slippers and stocking on the badge Mary the Teach had for Ruby Tuesday. Or is this a scene in Alice in Wonderland? The Yellow Brick Road is from Alice, but Rumpelstiltskin is from another tale, isn't' he? I am confused! There are more than one Fairy Tale going on here, wouldn't you say? Looks like a fun day at the zoo! Great photos! Happy MYM! Sounds like great fun. I don't normally like zoos. I feel sorry for the caged animals taken out of their habitat (and sometimes out of their warm native countries) to parade for our pleasure. I love parks though, where they have more space to roam about and somewhere to escape the humans when they want to. These are wonderful photos, and I'm glad you all enjoy such a fantastic place. These are such cute shots and what great fun. Enjoyed my day with you at the zoo. I have not been to one in a long time. Just the right touch of blues. I remember this place! I think I went there with my son many years ago. The name sounds familiar. Very charming place! Enjoy the first day of summer and MYM! A fun post! I kind of like the house with the many fairy tale references. Confusing for grown-ups but fun for kids. Its the best way to go...annual passes. I got a few of them, and its worth it. The place looks like a great outdoors for Ms T and the grown ups. Oh what a wonderful place to take the kid to..and you're right, paying one time price is still much cheaper than a single charge at a time..
Looks like a fun place to spend the day with the kids. That looks like a fun place to spend the day. Great photos. Sally is right. This is a scene from Wizard of Oz where the storm in Kansas takes the house for a spin and they land in oz, right on the wicked witch. We loved that movie as children. Dorothy was gifted the shoes and they helped her get back home. I am so glad you are having such fun with Miss T. You only live once and we need to savor each moment!